WOW! It looks beautiful on you. Love the color and the combination with the red lace. Thank you so much Sonja!! Wow it's so gorgeous!! You are very talented! You are the sweetest, thank you so much. YOU are talented, goodness that bomber jacket you just made is absolutely gorgeous! I'm so excited to have found your blog. what a lovely dress! i really love this red lace ! kisses from africa! Thank you so much Ines! So cool, all the way from Africa!? The internet is amazing, I'm so glad you'd check out my blog. Amazing!!! I love every bit of it. Red looks great on you, don't be afraid of it! I often find myself lurking through the luxurious brand's dresses and it would be so good to make a DIY piece from them... I hope in time I'll be able to do that. To be honest, the look-through side gives an extra, interesting detail so don't be bothered by it at all! Oh my gosh what!? You included me in your blog post, Reka I am SO flattered. Thank you so much, that just totally made my day. I'm so beyond excited to have found your blog too, sorry for going kind of comment-crazy on all your old posts. haha I love your style! This dress is stunning! I love the color on you. What a great idea on how to do the back closure, I love the small open part. Beautiful work! Thank you so much Lisa! The closure was kind of a spur of the moment thing, haha I'll admit. That's what happens when you can't find a long enough zipper I guess. ha! What a lovely dress! Truth be told, I'd much rather have your version than the designer one--you've taken all the best parts of the original but made it more wearable and, somehow, more luxurious. Do you have a special occasion to wear it for, or is it a "just because" dress? Wow seriously?? Thank you Caitlyn, wow talk about the best compliment ever. This seriously meant a lot to me for you to say, thank you. It's so lovely! You're amazing at sewing and executing your vision! Thank you so much Angelle!! YAY a post from you and OMG that dress is stunning!!! I don't think it looks weird- it's absolutely gorgeous and you definitely need to wear colors like this more often- SO GOOD. Ugh wish I could make my own clothes lol but I'm not even going to attempt it lol! Shira! Long time no talk woman, how the heck are you!?? You need to come out to Utah sometime and I'll teach you, k? :) For real though, my door is always open! LOVE LOVE LOVE IT. That lace is amazing, and you look beautiful. Autumn you are the sweetest, thank you so much. Thank you for stopping by and leaving such a sweet comment that made my day. Love the pictures....love the dress....love the girl. It is very very beautiful all the way around! Love YOU. :) Thanks Mom, you did a good job on the pictures I think so you should be proud of yourself. :) Thanks for taking them for me! Yes this is a very beautiful dress, Haylee! I love seeing photos of Valentino dresses - what a great source of inspiration! Your own dress is gorgeous, and you look beautiful. I'm always impressed by your talent in adapting and drafting! Sure! Would you like me to just share on the Facebook page or how does it work exactly? I'm a little hesitant to share on Facebook because I get shy about posting pictures like this for all my friends and family "in real life" to see. haha which is probably stupid of me but oh well, I'm shy I guess. But if there's another way to do it please let me know! Check out my page. What I do is share an image of your creation cite the pattern used and link to your post. When I do that I let you know on the post on question as it could be some time in the future. Don't worry if you don't feel comfortable. It is just a sewing page but I would be shy too, so I get where you are coming from hehe. Anyway don't commit just have a nose on my page first. This is so so pretty! Wow! 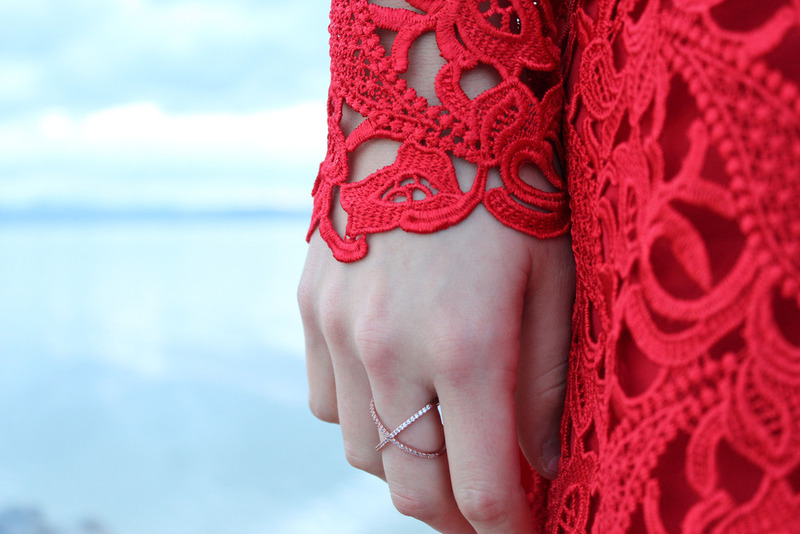 The pop of gold on the back is the perfect compliment to the red lace. Gorgeous! The lace is beautiful, and the red color looks lovely on you! I am very impressed you sewed such a structured lining with the boning. I adore how the lace scalloping looks around the neckline and cuffs. Beautiful work! EVERYTHING YOU MAKE. :O You are sooooo freaking talented and this dress is probably my favorite thing you've ever made! Seriously, number one fan right here, you're so good, Haylee! When are you going to do a fashion show, because you NEED to! I'm seriously in love with this dress. Ooh I love it, and I love the color on you! Though it did throw me off at first ha ha, not your signature style! =] I am very into lace right now. Also, these pictures make me miss Utah!! what happened to your tumblr? Wow I'm so flattered, I love you guys! I'm doing super well, much happier. :) Don't like to go into detail on here but you should add me on Facebook if we're not already friends! Gorgeous, and more gorgeous! I love it! The style and the color looks good on you. You are very talented, and I love your blog. This is perfection! Amazing job! Such a beautiful lace dress that is. thanks for sharing. This lace is GORGEOUS!!!!! And I LOVE those red lace inspiration dresses, can you imagine wearing something that luxurious? This is so inspiring, plus I've been looking at my friend Jen who's at Fashion Week.. and now my closet looks so mundane haha. Oh well. 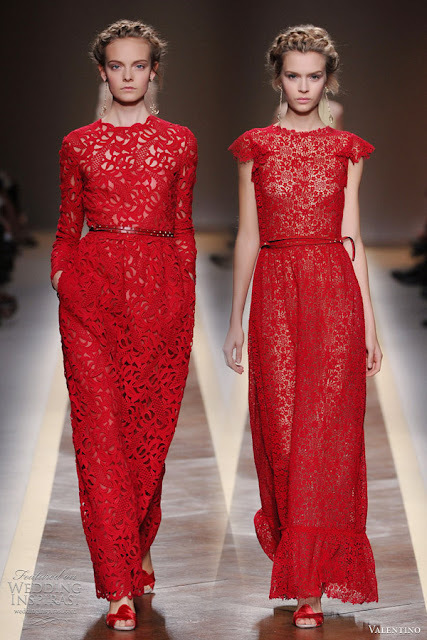 Wow, nice Red lace Fabric designs!!! I am so much happy after seeing these because I am a lover of Swiss voile lace dresses. Recently I bought a African lace wrapper and blouse set with unique embroideries and classy stones from Drem Fabrics, which provides the finest and latest collection of AFRICAN PRINTS also known as ANKARA at a great price. Thanks a lot!!! This dress with lace is adorable on you! I do love this color.black will make you look more gracious! If I've completely misunderstood you and you've been a long time sewist, then I definitely recommend Bernina's! They're expensive but fabulous. Let me know if there's anything else I can help you with! :) And thanks again for stopping by. Your dresses look so beautiful it's hard to imagine it was the result of a cheap machine! It really tells me that it all comes down to the skill of the sewist and not the machine. Great job dear.You looks so gorgeous and looks very pretty, festive dress! The colors and fabrics are absolutely perfect, and you look sensational. Great collection dear..